Callan Bentley, Geotimes contributing writer, has been traveling across North America in his Volkswagen Westfalia camper van this summer. Since May, he has been logging miles from Washington, D.C., up to central Alaska, and has now started heading back. When he comes across areas with interesting geology, he uses the van's solar power to plug into a laptop and fire off a dispatch for Geotimes. The following is Part 2 of his three-part roadtrip series. Travel, some would argue, is more about the journey than the destination. Certainly, a roadtrip is a throwback to times before frequent flyer miles: You navigate a landscape, and deliberately take the long way so you can experience something new. It's a pleasure to take the slow route, and nothing is more contemplative than a boat ride. In case you think "boat" and "roadtrip" don't mix, you should learn about the Alaska Marine Highway, a system of ferries that service the coastal towns of southern Alaska and connect them to the transportation system of the outside world. For four memorable days, water, islands and sky combine to create a scenic panorama that is constantly changing throughout Alaska's Inside Passage. Photo is by Callan Bentley. After logging 10,000 road miles on my van, the last of which (across the Yukon portion of the Alaska-Canadian Highway, or AlCan) were the worst, it was with distinct pleasure that I drove onto the M.V. Columbia, flagship of the Alaska ferry system, and set the emergency brake. It is a four-day ride on the ferry from Haines, Alaska (or nearby Skagway), to Bellingham, Wash. (a little over an hour north of Seattle). This trip through the Inside Passage is a remarkable experience both for its comforts and its geology, and well worth taking. The Inside Passage is "inside" because it travels through waters dividing the mainland from the Alexander Archipelago, a suite of 1,100 islands along the coast of southeast Alaska and British Columbia. The islands block out the rougher waves of the open Pacific Ocean to the west and provide a smooth transit. 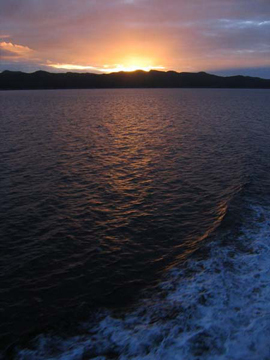 Because the Inside Passage is so calm, seasickness is rarely an issue (not to mention you don't have to worry about your vehicle rolling around on the auto deck). The ferry ride is not cheap, however: If you have a vehicle, and choose to get a stateroom, you'll pay extra for those services in addition to your personal transport ticket. The total bill for two people, one room (with private bath) and our van was close to $1,800. To me, that's a bargain because it means that I didn't have to drive the AlCan again, and saved thousands of miles of wear and tear on the vehicle (not to mention $3.50 per gallon of gas). If you dont want to splurge on a stateroom, you can camp on the ferry  just remember to bring lots of duct tape if you do, because stakes dont work on the metal deck. Along the journey, a representative of the U.S. Forest Service acts as the shipboard naturalist, giving talks about the land, wildlife and native cultures. If you need non-nature distraction, there's a movie lounge (equipped with recliner chairs), a video game arcade, a snack bar, a sit-down restaurant and a cocktail lounge. The bar is possibly the most singularly Alaskan aspect of the ship: I challenge you to name another municipal "highway system" that features its own bartender and velvet Elvis paintings on the wall. Glaciers are one of the first things to notice along your trek southward along Alaska's Inside Passage. Glacial ice in the passage is a weird, glowing shade of blue, somehow unbelievable until you see it for yourself. Photo by Lisa Dean. With all these amenities, and southeast Alaska's near-perpetual rain, you'd be forgiven if you did not notice the geology, but you'd lose out on some world-class geologic experiences. So  weather permitting  pull yourself away from the bar, and see what you can find. Traveling the Inside Passage from north to south, as I did, the first thing to notice will be the glaciers. The rocks of coastal Alaska are just now emerging from the last ice age, with large ice caps and valley glaciers still quite evident. In "nearby" Wrangell-St. Elias National Park, the Malaspina Glacier alone is larger than the state of Rhode Island. As the glaciers melt, they retreat up their U-shaped valleys. Those valleys at sea level fill with saltwater and become fjords. The ferry's trek begins in Lynn Canal, the longest and deepest fjord in North America  more than 2,000 feet deep in some places. Where hanging glaciers suspend above the fjords, they provide spectacular waterfalls that cascade down in misty white. Rainbow Glacier, southeast of Haines, is a great example. The clouds part, and there it is above you, big and weirdly blue, and hulking in a higher spot to which it has recently retreated. It is a magical sight. On stops in port, passengers aboard the M.V. 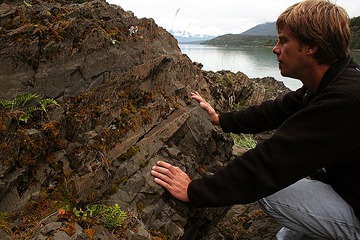 Columbia  the ship that ferries people and cars along the Inside Passage  can disembark to inspect the local geology, including siltstone and chert in Chilkat State Park, south of Haines, Alaska, which author Callan Bentley is examining here. Photo is by Lisa Dean. As you sail farther south, you'll see less evidence of glaciation at ferry-level, and the last tidewater glacier is visible across from Petersburg, calving icebergs into Frederick Sound. But the trade-off is that less ice means more rock, and that's a good thing. 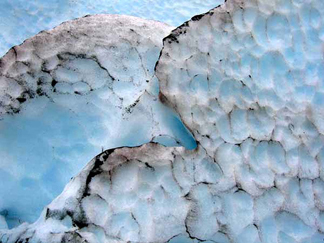 Alaska is composed of a great many crustal puzzle-pieces called terranes. Each is of a unique origin, and rafted tectonically up to its current location sometime in the past 200 million years. Like Alaska's resident humans, most of its rocks started off somewhere else. Based on paleomagnetic evidence, some of these terranes started off within 15 degrees of the equator. Shuffled along the faults of the Queen Charlotte Fault System (a northern equivalent to the San Andreas Fault in California), these terranes have been added piecemeal to the North American continent. 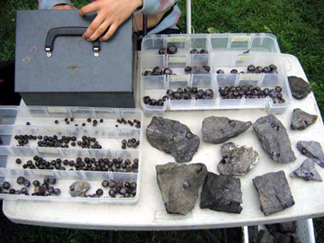 Mount Edgecumbe erupted as recently as 200 years ago, and a noticeable layer of grey in the Sitka soil profile is ash from an eruption 9,000 years ago. The mountain is a tectonic oddity. Usually, volcanoes are located at subduction zones, but Edgecumbe is located in a field of similar volcanic vents a mere 16 miles from the Queen Charlotte fault. There's no subduction for thousands of miles: What's going on? One possibility is that a minor fault in the Queen Charlotte system is acting as a pipe, funneling magma upward to the surface. In 1974  the same year the M.V. Columbia was launched into service  a prankster lit a pile of tires in the summit caldera, triggering fears in Sitka that the volcano was erupting again. The town of Wrangell, another stop on the ferry's route, is a good place to disembark and examine the gorgeous phyllite of the Taku Terrane. This silvery metamorphic rock is studded with enormous, perfectly-formed garnet crystals. The big red dodecahedrons are quarried by the children of Wrangell, from a ledge north of town. Notably, this ledge was once the site of a mine operated by the Alaska Garnet and Manufacturing Company, the first corporation in the world staffed entirely by women. Between Wrangell and Ketchikan is Prince of Wales Island, the third largest island in the United States. There, the rainy weather has dissected a significant amount of limestone out of the Alexander Terrane, yielding a "world-class example of karst topography," says shipboard naturalist Brenna Campbell of the Tongass National Forest. According to Campbell, places on Prince of Wales Island feature between 3,000 and 10,000 sinkholes per square mile, easily the highest such concentration in North America. Dodecahedral maroon garnets are for sale by the ferry dock in Wrangell, Alaska, one of the stops along the Inside Passage. Local children quarry these well-formed metamorphic minerals from a ledge north of town and sell them to geologically oriented tourists. Photo is by Callan Bentley. Caves on the island have yielded Pleistocene-age bones of species like the ringed seal and Arctic fox, which are now found only far to the north. During the height of the last ice age, these species shifted southward. In addition, a human jawbone was found in On Your Knees Cave, radiocarbon dated to be about 10,000 years old. This date almost doubles the previous estimates for how long people had been living in southeast Alaska, and raises the possibility that some human cultures may have migrated south into the "Lower 48" via the coasts, rather than by an inland route (see Geotimes, February 2004). Alaska is a land of superlatives. Exiting the biggest state in the union by ferry is a great way to go: lingering and contemplative. On my four days on board the Columbia, I spent many hours just staring out the window at the rainy, forested maze of islands. Traveling along a coast so naked and wild, uncomplicated by cities, is an opportunity to get a real sense of the huge, beautiful continent on which we live.